Have you ever taken a car out on a test drive, but wished you had just a bit more time to learn more about the infotainment system and the power of the engine? Well, you're in luck! With our Try Before You Buy Program, you can take an extended test drive to get to know the Volkswagen you've had your eye on for a while a little better. This program gives you the time you deserve to truly decide if a vehicle is right for you. Once you take the car for a test drive at our dealership, you can take it home overnight to try it out and see how it fits into your life. So, for example, take it home on a Friday afternoon and return it on Saturday. You can take it out to dinner, take it to the movies or take it home to see how it looks in your driveway. There's never been a better method to see if a Volkswagen model is the right one for you. We know that buying a car is a big decision, and it shouldn't be taken lightly. That's why we offer this program to benefit our customers. Trying before you buy enables you to ensure that you're getting the exact features, body style and engine type that fits your unique lifestyle. So if you think you might be interested in trying out this program, contact us and schedule your test drive now. 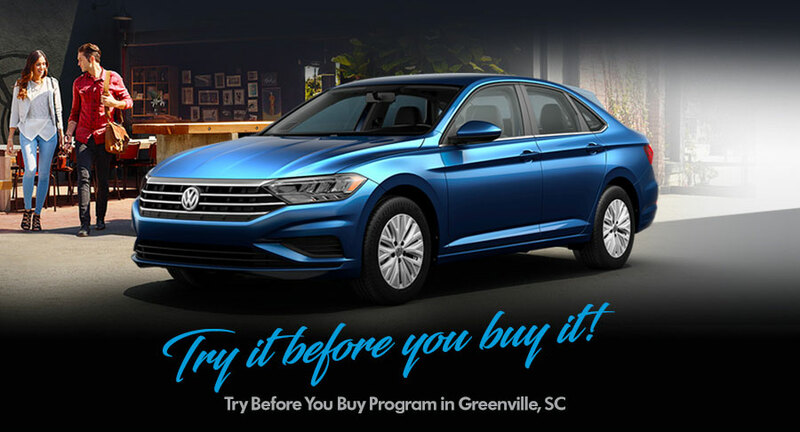 If you have any additional questions about the Try Before You Buy program or its specific details, please feel free to contact us directly or stop by our dealership at 100 Duvall Drive,Greenville, SC 29607. We look forward to serving customers from Asheville, NC, Columbia, Spartanburg, Anderson, SC, and throughout the Upstate.